It would be easy to drive past the entrance to Oliveto Restaurant & Bar and not see it, as I had done many times. Being hidden behind the entrance to Brays Bay Reserve on busy Concord Rd in Rhodes, apart from the sign, the actual building is hard to see. It wasn't until we took our son to the beautiful waterfront park to play that we realised, there actually IS a restaurant back there. And a great one at that. 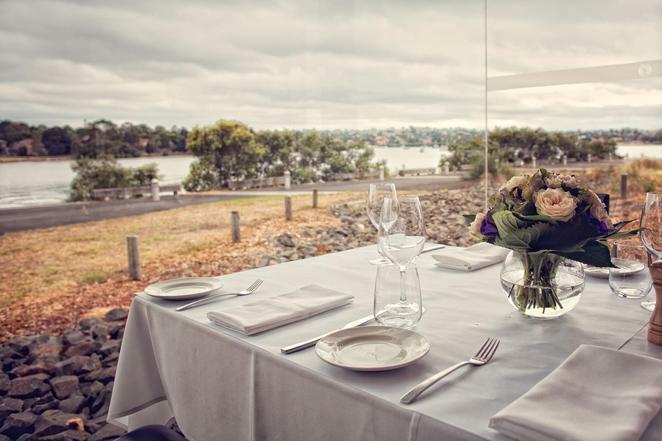 Family run and owned for about 10 years now, Oliveto Restaurant & Bar has recently undergone a renovation, the walls that divided the room are no longer there and the space now makes the most of the serene waterviews right on its doorstep. Expansive floor to ceiling windows open onto a surrounding deck and a brand spanking new bar sits on the left as you enter. Although the restaurant wasn't bad before, it has definitely gone up a notch in the style stakes. Oliveto Restaurant and Bar is open for lunch Monday - Friday & Sundays from 12-3pm and dinner Tuesday - Saturday from 6-10pm. They host some very fine functions here and you can view the sensational photos on their Instagram. For further information please visit their website or facebook page.